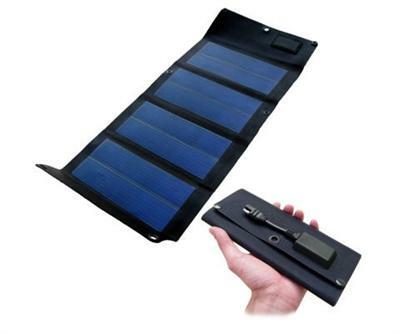 A foldable solar charger, this item will charge your handheld electronic devices by their car cigarette lighter plug or USB. Water resistant, lightweight and very portable, it weighs only 230g and when folded it will easily fit in your bag. Perfect for trekking and camping trips - it's just the right size to strap to your backpack using the reinforced eyelets (and your bungee cord). Plug the solar charger output cable, with the relevant adapter(s), into your electronic device. Unfold the solar charger and face it towards direct sunlight. Your device is now under charge. * Flexible, ultra-light, portable and pocket-sized (well almost) when folded. * Dimensions (mm): 215 x 95 x 20 (closed), 530 x 215 x 5 (unfolded). Buying this product will earn 1122 Loyalty Points. Be the first to submit a review for the 6.5watt Powertec Folding Solar Charger.